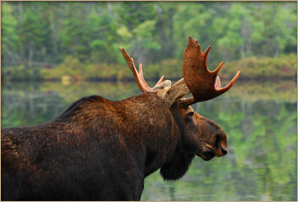 Welcome to Canada's NW Ontario for Your Ultimate Hunting Experience! Moose: "A Lot of Bull"
Dryden’s ‘Max’ the Moose is a tad larger than the specie known as alces alces andersoni which frequents our forests. 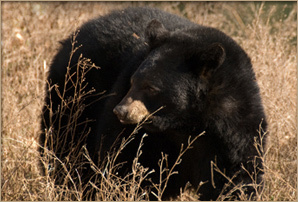 Our Patricia Region has a large & stable population with many opportunities for both hunting & photography available. Summer canoeing & boating finds moose feeding on the roots of submerged plant life. Most hunting centers around the ‘RUT’ which occurs mid September to mid October. Archery seasons have become very popular. There is nothing more exciting than having an experienced moose guide call in a 1000 plus pound Bull Moose to within 30 yards or closer of your blind!! Whether you paddle rivers, wander harvested forest areas, or fly into a remote wilderness location to experience the majesty of moose encounters, the Patricia Region in Canada's Heartland has it all. Most recent studies indicate that Ontario has a staggering 138,000 to 152,000 bruins and growing which may be partially attributable to the fact that there is now only 1 hunting season in the fall. The spring bear hunt was terminated in 1999. The Patricia Region is in the heart of some of the best bear habitat in Canada and there are black bears literally everywhere, with many color phase sightings as well. Whether your interests are in photography or the hunt of a life time with one of our Outfitters, the Patricia Region in Canada's Heartland is definitely, the place to come. The infamous ‘Dryden Buck’ shot illegally by a Louisiana hunter & the media attention it created, blew the lid off Northwestern Ontario’s best kept secret: its Trophy Whitetail population. Current forest harvesting practices, combined with milder winters have led to a continual increase in numbers. A great combination of boreal forest habitat surrounding local farming activities seem to provide, not only the diet necessary to produce some enormous racked animals, but also huge bodies. 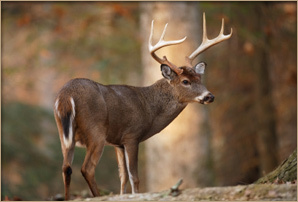 The average 8-point adult whitetail tips the scales in excess of 200 lbs. The Patricia Region is the ‘NEW’ trophy whitetail deer hunting hotspot in Canada. Our area is on the edge of the migratory fly ways, so a solid resident mallard & teal population provides most of our duck hunting opportunities with occasional transient flocks frequenting wild rice bays in area lakes. A Migratory Game license is needed to hunt waterfowl. 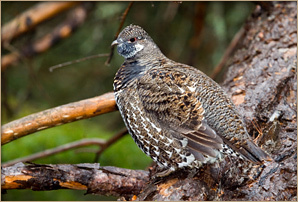 Grouse hunting for Ruffed & Spruce is good to excellent most seasons along forest edges with a growing Sharp-tail population occupying farmer's fence rows. A Small Game license allows you to hunt grouse, fox & rabbit. Although it is also needed to hunt Wolf, a special tag must also be purchased to legally pursue this wary & abundant predator. The beauty of choosing the Patricia Area for your ‘small game & waterfowl’ hunting is that it can be combined with some fantastic fall fishing to achieve an outstanding wilderness vacation.